While I do love thrift store shopping, searching the basement at my parents' house is even more rewarding. In fact, that's where I have discovered most of my vintage style stuff - vintage board games, vintage dishes, old toys and other treasures. These discoveries have the added benefit of being infused with nostalgia. And, of course, they are free. That never hurts. While browsing the basement a few days ago, I spotted a little vintage suitcase. I thought I had unearthed all the treasures in the basement by now, so I was a bit surprised I hadn't seen the suitcase before. Opening it up, I found a nice surprise inside. 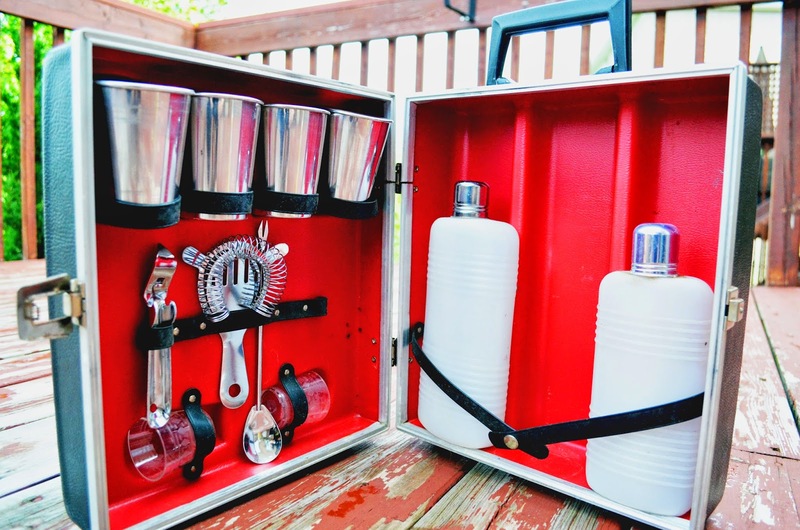 This case houses a vintage travel bar/liquor set so you can take your bar supplies on the road. It's a tiny liquor store in a box! For many years, my parents drove their motorhome to Florida every winter. 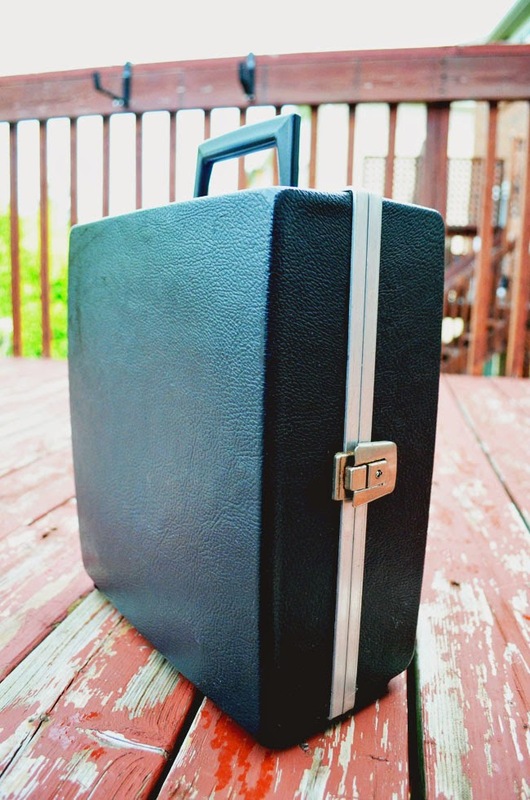 Mom says they used this little suitcase to bring their bar supplies to the clubhouse at the trailer park. Unfortunately they can't travel anymore, so they have no need for the case. In case you are wondering about my apparent greed, my parents are happy to get rid of stuff as long as it gets a happy home. I am thinking this would be a fun traveling bar for camping or visiting friends. What kind of vintage style stuff do you like to collect? Have you inherited vintage pieces or is it all about thrift stores, flea markets and garage sales for you? Wow ,love this Travel bar ,it looks amazing and also super cute :) ,great find! Well, you are all set for the summer now!! My Grandma gave me a kit exactly like this, minus all the kit pieces! She brought the empty box over to me one day, saying she knows how much we like to party so she knew I could use it. Um, thanks? I haven't used it but I also still have it, 5 years later! Love these! We had one, but never used it, so we sold it. But I appreciate their awesomeness! Oh that is too awesome!! And it also opens the whole idea that at one point bringing your own cocktails was such a deal that they manufactured travel suitcases for them lol! Ah, the good ole days! OH! I wish my suitcase had a little bar in it! So fun. Thanks for linking up Joann!